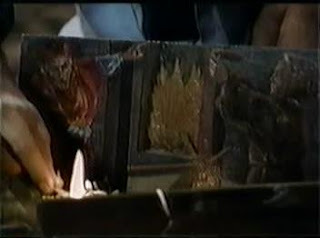 The episode opens in a rich man's loft - his employee has brought him the latest container of purloined antiquity. It seems the rich man is a dealer in such things, especially the rare and macabre. At first the contents seem like a disappointment, but then, beneath a false bottom, he discovers a rendering of a satanic ritual! The rich man is pleased with the quality of the piece, and anticipates turning it over for a large sum of money. Hearing about that prospect, the worker asks for a little raise in his percentage. The rich man, naturally, isn't interested in that idea, and instead tells the worker that the only way he'll ever be successful is if he figures out some way to screw someone over and take their action. Which is completely advice you want to give someone in this situation. That night the lights in the rich man's apartment go off, and he discovers a mysterious monk waiting for him. Despite the oddness of the situation the rich man lets the monk say his piece - which involves explaining that the painting has value beyond the monetary. Naturally the rich man isn't hearing any of it. Even when the monk points out that the 'mere beggar's bowl' that the rich man dismissed from the crate is actually the relic of a saint. I'm actually a little shocked that the rich man didn't understand the bowl's significance earlier, since it was actually rendered in the painting he found so compelling. The monk had come out of it! Oh, and the rich man is the chained guy lying on the ground. That's right - the rich man is now a prisoner of the inquisition! Charged with his thefts, he faces the judgment of the church. Despite the painful reality of this 'dream', the rich man still refuses to confess and repent. Now that's stubbornness! He finally confesses after being stretched out on a rack, and after he promises to return all of his goods, the inquisition decides to release him. Which marks them as far more reasonable than the actual inquisition. True to their word, the rich man finds himself back in his apartment moments later. What does he do? Immediately tries to sell the painting to one of his scummy clients! Man, people in fiction never learn from their supernaturally-induced delusions, do they? Hold on, now he's trying to burn it? So the sale wasn't for the money, he just wanted it out of his apartment? You know you can just mail the thing back to Spain, right? The church's address can't be hard to find, and it won't cost you more than twenty dollars to bubble wrap that thing and air-mail it over. No, he tries for the bonfire effect, but it proves pointless. The painting simply will not burn! 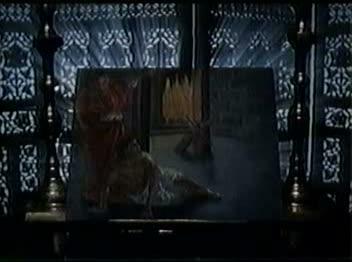 Attempting to do so angers the inquisitor, however, who disappears from the painting, looking for vengeance! Since he doesn't know what's coming, the rich man continues his attempts to get rid of the painting by any method that doesn't involve simply mailing it back to the church. This time he tries to sell it to his workman, who agrees to buy it. 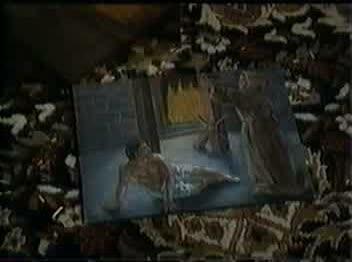 Before he can arrive, however, the Inquisitor makes his presence known, and traps the rich man in the painting forever! Naturally this seems like a windfall for the workman, who arrives moments later, but a bright light flashes when he touches the painting and the rich man's body appears, so we can be assured that a similar fate is going to befall him quite promptly, even though the episode has ended. While it wasn't the greatest episode, I've got to applaud the producers of this episode for using the old 'multiple copies of a painting with slight differences' trick. It not an expensive gag, but it's one that I've always found particularly effective at creating a low-level baseline chill.